Any organisation that is trying to develop a culturally diverse workforce will be able to appreciate the importance of unconscious bias and the impact of first impressions on the recruitment process. Cultural Intelligence is an oft-overlooked tool that has a significant role to play as a safeguard against unconscious bias. Bias is a human condition. We are all biased and we need bias to navigate our way through life. Faced with thousands of decisions to make each and every day our brains develop heuristics or short cuts as a decision-making tool. For instance, bias can lead to negative inclinations and prejudice in our decision-making process, particularly if we are unaware or unconscious of the bias we are using � a term commonly known as Unconscious Bias. An affinity bias is the concept that we are attracted and drawn to people who are similar to us. We look for similarities in others because we feel comfortable and tend to trust people who are similar to us. In a cross-cultural aspect, this is part of the reason why we gravitate towards people who share a common cultural background. In other areas of life, we may gravitate towards people who come from the same town or city, or attended the same university, or share a similar profession, interest, religion, etc. We feel safer in circumstances where people are similar. Unconscious affinity bias has a significant impact on recruitment processes in most organisations. The selection process is plagued by the unconscious drive of recruiters to find some aspect of affinity in their candidates. This is not always a bad thing in and of itself except when we are unaware of our decision-making protocols. Recruiting from a diverse and international candidate pool does not necessarily translate into a diverse workforce. One of the challenges of recruitment is that certain behaviours, styles of communication and body language do not have the same meaning across different cultures. For example, in countries such as Malaysia the etiquette for shaking hands is a soft handshake to demonstrate respect. Conversely, in Australia a soft handshake can be interpreted as a lack of respect, sign of disinterest, weakness and insincerity. A handshake is not a universal truth, but rather is culturally bound. When we interpret behaviours we tend to compare them based on our own cultural practices or norms because we are familiar with them. Depending on a recruiter�s own national culture, one of the above handshakes may give off a bad initial impression. Further unconscious biases may come to the surface and trigger the recruiter to look for evidence to support their initial impression thus exacerbating the situation. There are so many subtle cultural nuances. For example, how long should one look at someone in the eye, when does a look become a stare? Who should pay for food and/or drinks when entertaining a client? Different cultures will have vastly different answers to the above questions. These cultural nuances tend to play out negatively in a recruitment context if the recruiter does not have Cultural Intelligence. How can I develop flexibility and cultural agility and why is this important? How can I learn the behaviours and values of the cultures that we are working with and recruiting from? Ultimately, a higher level of Cultural Intelligence across a recruitment team will help to flatten out the impact of minor and inconsequential first impressions. It will also seek to counteract the significance and power of unconscious biases, such as affinity bias, to negatively disrupt any organisation�s path towards inclusion. Newsletter Reader Question: One of our readers recently raised the following question - How do we know whether a conflict that we have with someone is cultural or simply personal? Let me start by stating that you don't need to work across cultures to have conflicts. We have conflicts with people in our own culture. We have conflicts with people in our own family! So what happens when we interact with people who live in a different land, have different belief systems, different languages, and different ways of looking at the world? If your interaction with an individual is leading to a disagreement or to a conflict, do not assume straight away that it is cultural. If it's a one-on-one interaction, it could just be personality. We all have different personality styles. When we talk about cultural conflicts, it is usually something that's a pattern with a group of people. Here�s an example: I had an Australian client who was doing some work in Brazil. He said one of the things that used to drive him nuts was that the meetings he had would never start on time. He would turn up on time and the meetings would always be 20 minutes, half an hour, 45 minutes late. People would also be coming in and out of the meetings. This sort of conflict is cultural - there's a very different view of time in Brazil (polychronic) compared to Australia (monochronic). My suggestion to the client was that he needed to learn how to relax. When he got irritated about the lateness of the meeting, he went into the meeting in a much more aggravated state, which then in turn had a tendency to reduce his colleague�s listening. As a general rule of thumb, if you find that people in the particular culture all tend to act a certain way that is a good indicator of a potential culture conflict. It could be their view of time or it could be the way people address you. Or it could be the way they discuss certain topics. Alternatively, if you are dealing with someone where you have a simple one-on-one disagreement that is more than likely to be a personal conflict (this is sometimes referred to as personal culture). Learning to deal with conflict, whether it�s cultural or personal, is something that we all need to navigate as human beings. Have you ever considered the following question - What is poor listening costing you, your team, and your organisation? Did you know that 55% of your day is spent listening, yet only 2% of people have had any formal training in listening. Most listening literature is focussed on how to listen better by being completely focused on the speaker. This is useful but a more effective and impactful way exists. Oscar Trimboli�s Deep Listening is focused on explaining how to listen better. 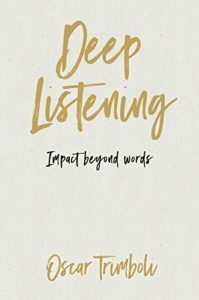 This beautifully packaged, pocket-sized guide will help you to explore the skill of deep listening, to create the space to listen internally before you listen externally. You�ll learn to listen beyond the actual words, and tune in to what�s not being said. This book will help you to move away from confusing and complicated discussions, and instead start to cultivate dialogue that is clear, considerate and insightful. We are currently hiring for a part-time Practice Manager at Cultural Synergies. If you are interested and would like to know more about the role please contact us at enquiries@culturalsynergies.com.